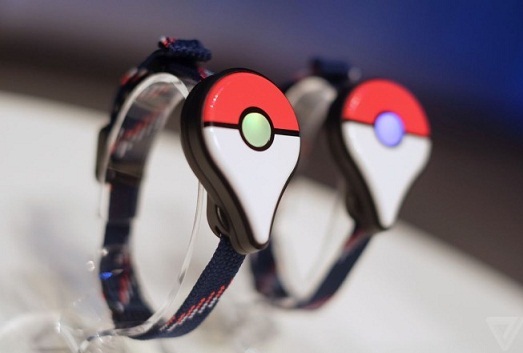 Pokémon Go Plus is a Wearable Wristband on which a button is attached, which has the form of a Pokeballs. What features it has, how high is the price and when the release of Pokémon Go Plus is planned, learn it in our article. In this way, you can consider whether you want to pre-order the wristlet. Pokémon Go Plus is intended to avoid the forced to look to the smartphone. With this wristband you will be able to pass through the road with his eyes open, without missing anything important. The dimensions of Pokémon Go Plus will be 46 mm x 33 mm x 17.5 mm (weight: about 13 grams) and the associated strap is adjustable. The following list contains more information and features of Pokémon Go Plus. - It is up to you whether you want to wear Pokémon Go Plus as button or the included strap. The main thing you find having the device is that you can feel and see the signals. - You find yourself, for example, near PokéStops or Pokémon, send Pokémon Go Plus LED and vibration signals to draw your attention on it. - The Pokémon that are already in your Pokédex are registered, you can catch easily with the button on the Pokémon Go Plus, if you have Poké Balls in the backpack. Then new Pokémon you must you continue to grab manually. - Pokémon Go Plus if worn with or without a bracelet is connected via Bluetooth with your smartphone and draws its energy from a lithium coin cell. - Compatibility with iOS / Apple: iPhone 5, 5c, 5s, SE, 6, 6s, 6 Plus, 6s Plus with iOS 8-9. - Compatibility with Android: tba. The Pokémon Go Plus doesn’t have an officially release yet. This means you still have some time to reconsider whether you want to spend around $ 40 for the bracelet with buttons. The fact is that there is also a Bluetooth function and that’s going to drain your smartphone battery too fast. Maybe you can reduce the screen brightness to consume less energy, but in case if the GPS signal drops out then no actions will be counted. Check out our guide on how to save your smartphone battery while playing Pokémon Go. Nevertheless, if you want to buy Plus Pokémon Go, then we recommend you to pre-order in time because of the stock in the US was sold out even before the release. Currently you can Pre-order the bracelet with Button only in Nintendo Online Store. However, there the Pokémon Go Plus is not available.